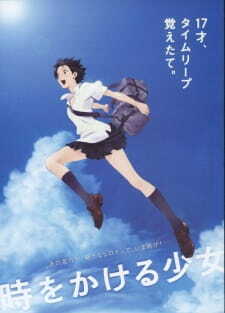 An animated film about a girl who discovers a power to literally 'leap' through time. She uses this power to change little things that happened in the past however she soon discovers that changing her past can have drastic consequences. This anime is cute, funny and emotional in many ways. The power to travel through time... It can be used for the good of humanity, or just selfishly abused. While many may fantasize about obtaining such a power, it has become nothing less than reality for otherwise-normal schoolgirl Konno Makoto. I have always loved time-travel related films and this one has satisfied that desire. Toki wo Sakeru Shoujo is a simply beautifully illustrated animated film about an ordinary everyday girl that discovers a power that enables her to literally 'leap' through time. I found that pretty cool beginning of the story. She then uses this power to change little events that happen in the past to make her life a bit easier. However, as she uses this power, many events change and the future is altered. She soon discovers playing with time can have drastic consequences. I found this story really intriguing and I applaud how the creators kept the story simple yet self explanatory so that the audience can easily understand what is happening throughout the film. The art was beautifully illustrated in every way. The sceneries really brought out the emotion brought out in the film and the characters themselves were smoothly animated. I loved the time distortion effects and the main character leaped back in time. You will get used to the film's art style straight away because of the 'naturalness' in the characters and scenery. This was really well done for an animated film. The voice acting was perfect in every way. The theme songs were memorable and emotionally distinct from the usual norm. Much effort has been out into this film and it is really shown throughout the film. Sound effects were appropriately used in the may time-leaping scenes. All I can say is that I had no problems with sound quality and quantity at all. Characters were well-loved and memorable right from the start. You will never forget the main character as she stumbles across this new power, taking advantage of it and in the end saving the one she loves. At an emotional level, I felt a connection with the main character. The creators of this film has done a very good job in connecting the characters of the film to the audience to successfully portray the thoughts of feelings brought out by this film. In the end, I highly enjoyed this film. I think it was appropriate that the story was just limited to an animated film. If it was transposed into a TV series, I don't think the natural thoughts and feelings from this film would have successfully imprinted on to the audience. I loved the story, the art was excellently illustrated and the characters were memorable. I highly recommend anyone to watch this anime even if you are not really a slice of life anime fan. Well written story that has successfully been told in an animated art form. It is captivating right form the very start. No time is wasted in developing the main characters and background information. Beautifully illustrated in every way. The characters and scenery really complemented each other. Appropriate theme songs and well voiced characters make this anime that much more enjoyable. Loved the characters right from the very start. The quirkiness and naive attitude of the main character was enjoyable to watch. I enjoyed the film very much! I wished it was slightly longer so it could explain some minor details a bit more. It was fun, enjoyable and just well put together. I highly recommend this anime for anyone to watch. Today's 25c deal is Smart Tools. This app allows you to measure length, angle, distance, height, direction metal sound and much more. It is generally categorised in four parts. Part 1 measures length and angle, Part 2 measures distance, compass tools for Part 3 and sound/vibration measurements for Part 4. So, it you are a frequent tool user, this app is for you. Get it now from the Play Store here for 25c. Today only.